There are many different ways to play football. Some prefer short passing with plenty of combinations when attacking while others like long balls to a target striker to try to create chances. The same goes for defending where some uses a strict positional defensive style and others implements man-marking across the pitch. The differing styles and ideas is what make football such a fascinating sport tactically and there is no right or wrong way within the game of football. This season in Italian football especially, we’ve seen many teams adopt man-marking defensive setups in specific areas or across the pitch. In this article we’ll look at the different types of man-marking most often used and also use video analysis to look at which teams implements this strategy successfully. This type of man-marking is quite common as one player within the defending team marks a direct opponent. For example, many teams have used this tactic against Lionel Messi in a bid to limit his influence on a game. Athletic Club used this in the 2015 final of the Copa Del Rey with left back Mikel Balenziaga tasked with marking Messi and following around. With a player like Messi who likes to move freely, this causes the defensive team a problem as the player will vacate his position and a space will open up. However if someone else covers this space then the positives are that the marked players influence can be limited and stifled. We often see this in the centre of midfield too, for example Danny Welbeck man-marking Xabi Alonso very effectively in the Champions League round of 16 in 2013 or Ji-Sung Park doing it brilliantly against Andrea Pirlo in 2010. The positives of this approach are obvious; you can limit the influence of a key player within the opposition by marking him tightly and restricting the opposition of playing through one of their most important players. The negatives are that if the marked player is clever and moves into uncomfortable positions for the marking player then it can cause problems as spaces can open in dangerous areas where the rest of the team can struggle to cover. This approach was something we saw last season with Louis van Gaal’s Manchester United as the central midfielders man-marked their direct opponents in midfield. This can be effective in terms of stopping a team playing through midfield and forcing them to go long or along the sides where they are likely to cause less trouble. However, just like with individual man-marking, if the marked players moves wide for example then huge spaces will open up in the centre of the pitch for other players to exploit as the defending teams midfielders has moved wide and vacated the middle. Also, some teams use a player that marks a specific zone, for example the ten space just in front of the back four. This player will man-mark anyone that moves into this zone, whether it’s a classic number 10 positioned there, a striker dropping deeper to receive or a midfielder pushing on. This can limit the opposition’s chances of accessing a key area of the pitch where they look to create chances. This variant was quite common in the past where each player was assigned a zone and marked the most dangerous player in that zone. For example, a left-back has his zone and if he has a winger in front of him then he will mark the winger. If, however, the striker moves into the left-back’s zone and is closer to the defender’s goal than the winger then the left-back will leave the winger free and move back to mark the striker. So if the defending player only has one player in his zone then he marks that player while if there are two players in his zone then he marks the most dangerous one meaning the one closest to the defender’s goal. Collective man-marking was the most used defensive setup back in the 50’s, 60’s and 70’s where each player had a direct opponent to mark. In the modern game, this is harder to pull off as players move more freely and are more similar athletically. However, we’ve seen teams like Atalanta and Genoa perform this style of defending perfectly during the course of the season. In the game examples below we’ll take a closer look at this. The positives of collective man-marking is you can hopefully stop a team from playing their normal game as they won’t be comfortable receiving the ball under aggressive pressure and tight marking of a defender. If some flexibility is allowed between the players then they can also pass over players to each other which can help the team from not destabilising their structure completely. The negatives is that you’re always reacting to the other team and their movements and never really in control over what happens which you can be in a positional defensive system. This is an example of a Napoli free-kick in the game between two of the top sides in Italy back in October 2016. Juventus lined up in a 3-5-2 with Napoli in their usual 4-3-3. Juventus back three marked Napoli’s attacking trident, most often as above but also with zonal man-marking as the attackers changed positions. If for example Mertens and Callejon swapped positions then Bonucci would mark Callejon and Chiellini Mertens as they were now in that defensive zone. Wing-backs Lichtsteiner and Alex Sandro maintained access to Napoli’s full-backs with their positioning to make sure they could always quickly apply pressure. 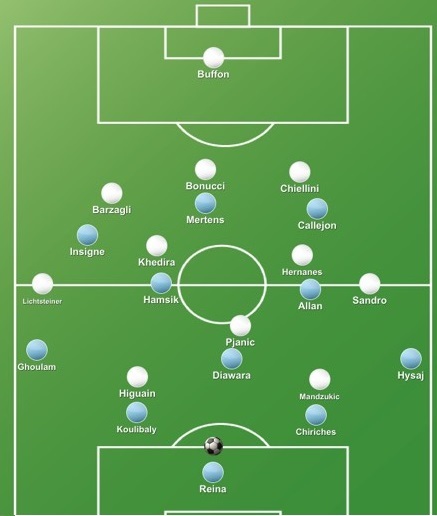 In midfield, Juve matched up man for man with Napoli’s midfield three and the two strikers marked either centre-back. In the video above we clearly see this approach. As it says in the video, Juventus’ zonal man-marking means when Hysaj ends up in the midfield zone Hernanes goes to mark him instead of the previous midfielder and the same happens when Hysaj makes a run into Chiellini’s zone. With this tactic in the particular game, Juventus could stifle Napoli’s fluent possession game to emerge as 2-1 winners in a quite scrappy clash. Atalanta under Gian Piero Gasperini has been the big surprise in Italy this season as they’ve clinched European football next season with a fifth place finish. They’ve used a collective man-marking approach all season and this has been particularly successful in the games against Juventus, Roma and Napoli; the best three teams in Italy that normally dominates their games. Against Napoli, they man-marked every player apart from the two Napoli full-backs which would only really be pressed when they closed in on the halfway line and the ball-near Atalanta wing-back would sprint to close them down. By this time, the full-back had no option as all his teammates where man-marked. In the video we see this approach. It worked perfectly as Atalanta won the game 1-0 after stifling Napoli and they used the same approach in the return leg at the San Paolo where they ran out 3-1 winners. They used their collective man-marking to similarly impressive results against Roma, winning 2-1 in Bergamo and drawing 0-0 in Rome. Against Juventus, they did lose in Turin, but they were extremely impressive in Bergamo as the two teams played out a 2-2 draw. Atalanta’s basic approach would look as above. Alejandro Gomez was the central striker and was without a direct opponent instead pressing the centre-back in possession and preventing the switch to the other centre-back. Cristante and Freuler man-marked aggressively in midfield with Kurtic and Hateboer marking Juve’s full-backs. Andrea Masiello followed Paulo Dybala around with Mattia Caldara doing the same with Gonzalo Higuain. Wing-backs Spinazzola and Conti marked Juve’s wingers while only Rafael Toloi was in a covering position. We see this approach in the videos below. Note how far the centre-backs Masiello and Caldara in particular are willing to follow Dybala and Higuain. As a disciple of Gasperini, it might not come as a surprise to learn Ivan Juric also implements a collective man-marking scheme when defending. Genoa have endured a tough season and still risk relegation with Juric having been sacked but then reinstated after Andrea Mandorlini failed to improve results. The highlight of Genoa’s season is their stunning 3-1 win against Juventus at Marassi. 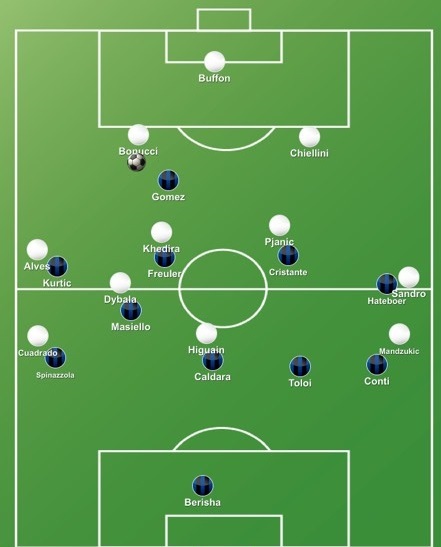 Initially, Juventus lined up in a 3-5-2 and Juric matched that with his trademark 3-4-3 which became 5-2-1-2 in defence as they man-marked collectively across the pitch similarly to Gasperini with a spare man at the back and leaving one of Juve’s centre-backs alone. In the two videos above you can see this approach deployed by Juric. After Genoa had raced into a 3-0 lead in the first half, Max Allegri changed his shape into a 4-3-1-2 with Dani Alves moving from right centre-back to central midfield. This meant Juventus now had a numerical advantage of 4 vs 3 in midfield. Straight away, Juric adopted his formation and moved left wing-back Diego Laxalt into midfield and forward Lucas Ocampos to left wing-back which resulted in a 5-1-3-1 defensive formation to match Juve evenly in midfield and maintain their collective man-marking. The result is seen in the video below as Genoa saw out the game and won the game 3-1 despite another formation change from Allegri to which Juric responded again. There has definitely been a trend in Italy especially this season for collective man-marking or other types of man-marking. We’ve also seen this in England with José Mourinho in particular using a collective man-marking approach against Chelsea and individual man-marking with Axel Tuanzebe against Alexis Sanchez when Manchester United visited Arsenal. With the success of Atalanta this season we’ll likely see more teams tinkering with man-marking schemes in different games, just like Juventus who have used positional defending as well as man-marking in certain games. With teams becoming ever more evolved tactically it won’t be surprising to see a future where teams can adopt positional, zonal and man-marking defensive setups. The positives are clear to see; stop teams and individual players from playing their normal game where they feel comfortable and confident. It’s no surprise to see teams adopting this style of defending against Napoli for example with their insane ability to always create chances against deep defences but have lost against both Juventus’ and Atalanta’s (twice) collective man-marking. The negatives are also clear as you’re always reacting to the style, changes and movements of the opposition like Genoa showed in their win over Juventus, even though they ran out winners. In a one off game it can prove effective and successful, but will we see teams other than Atalanta consistently thrive with this approach? It remains to be seen and the future of football looks likely to be as fascinating tactically as ever before.